Whether you’re building a “man cave,” furnishing a rec room or looking for a more interesting dining room table, adding a billiard table to the house immediately injects more fun and activity into your home. Pool tables let you play games with family and friends without having to bring a pocket full of quarters to the bar or pool hall. Additionally, billiards tables can be stylish furniture pieces in your home. 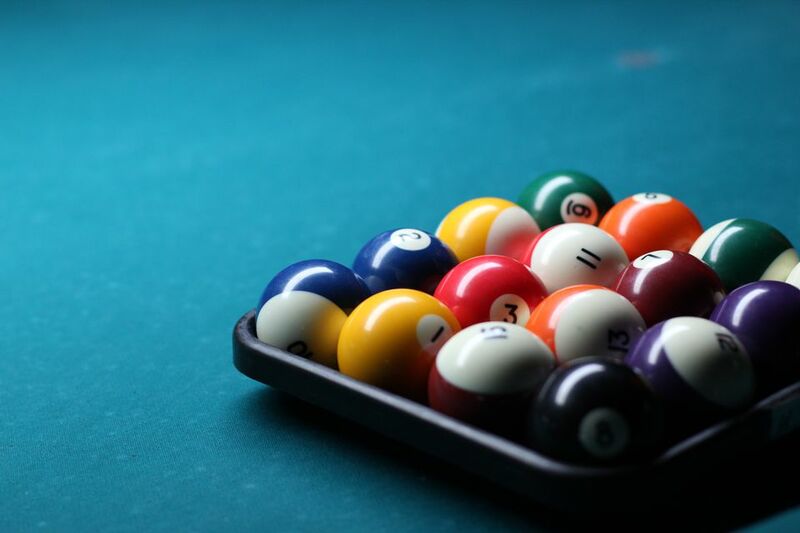 There are so many types of pool tables that you’ll surely find one to meet your needs, whether it's a classic 8 foot table, a portable pool table, a durable outdoor version, or conversion top billiard table. When you buy your pool table be sure to take into account the size of your space where you want to place the table. For example, you need more than a 12' x 16' space to play pool on a typical 8' x 4' pool table. Additionally, consider the materials that compose the table. The best pool tables are made with slate playing surfaces, which are level and durable. Everything from the cloth covering to the wooden base varies in quality and price for pool tables—so make sure you get the style and function you want. Check out our list of the top pool tables on the market. The EastPoint Sports Masterton Billiard Table is a classic, fun pool table. Inexpensive and massively popular, this 87" pool table fits well in a basement, game room, or garage. Although the EastPoint table has a traditional, parlor-style design. It is made with a number of more durable features. For example, the drop pockets are covered and the top rail looks like stained wood but is coated with LusterLong to resist scratches and wear. The table’s feet boast a clawfoot design, but also hide small, built-in leg levelers and are not made of wood. With the EastPoint table, you get cues, balls, chalk, a triangle and a brush as well as K66 rubber bumpers. The 7' 3" long table is about 50" wide, 31" tall and just over 200 pounds. There is a 17' x 13' recommended clearance area and some assembly required. The table is designed for families and beginners, with simpler parts and a much lower price tag than many competitors. Pool tables are obviously a big piece of furniture, but you don’t need to break the bank to get a quality billiard table that will look great in your home. The Harvil Beachcomber Indoor Pool Table is a great and popular option that costs less than $1,000. Measuring 4' x 7', this table is no miniature toy. The Beachcomber is full-sized and allows you to play any game you want, but is more likely to fit in a regular household room. The table is 31" high and weighs 231.5 pounds. It does require assembly, but this table also comes with 16 billiard balls, 2 cues, a triangle, a brush and two chalks, so you can start playing the second it is built. People love the Beachcomber for its light wood grain exterior design as well as the blue tetolon cloth playing surface and stylish chrome finishes. Additionally, the table has rubber bumpers and adjustable legs to ensure a fair game every time. The company provides a warranty and a free repair of any defective parts. This pool table is particularly popular in family game rooms. The Mizerak Donovan II is an 8' pool table that is priced well. Available in either slate or slatron—both for less than $2,000—the Donovan II lets billiards players have a really high end able at home without going overboard. This popular table also sports a particularly modern design. With an 8' playing surface, the table is about 31" tall and 55" wide, with a shipping weight above 300 pounds. Although dimensions are critical for anyone buying a pool table, it’s the stylish red and black design that will really attract people to this Mizerak offering. You get a table with a durable red cloth playing surface designed for longevity, a black cabinet, and chrome-accented corners. Additionally, the table features rubber bumpers for predictable ball returns and adjustable feet that are easy to level at home. You also get internal drop pockets for a more contemporary ​look. The Donovan II comes with two cues, a set of 16 balls, a triangle, chalk, and a brush as well. Harvil’s “Bellagio” billiards table is a truly high-quality option for any home, which is delivered and installed by professionals. The 8-foot table has a classic design that would look at home in a parlor or library. The slate table is made to be consistently level and allow for the most fun and competitive games. When you purchase the Bellagio, you’re getting a pool table made with strong, dense wood, and a birch veneer cabinet stained in an anti-scratch port tone. The table has thick and durable wooden railings, hand-carved wooden claw legs and feet, and parlor-style drop pockets. The playing surface itself is covered with a 75 percent wool and 25 percent nylon cloth mixture that is available in a classic red or green as well as a blue or brown. The table is 54" wide and almost 32" tall and weighs nearly 700 pounds. This high-end pool table has the style options to fit any room or home from a sports-filled man cave to a chic, home office. The Bellagio also comes with a plethora of accessories including everything you need to play right away from four Canadian maple cues to a tally shaker bottle. Simple, stylish and surprisingly affordable, the Minnesota Fats Covington Billiard Table is great for people’s homes. Whether in the basement or the garage, the 8' table catches one’s eye with its claw feet clutching stylish bronze balls. These claw feet in addition to the oak veneer make this pool table look great in just about any game room. However, this table also features a bargain price and a strong wood-engineered internal frame. True pool lovers will like this full-sized, 8' table because the rubber-lined oak rails give you a good and reliable bounce with each touch. Homeowners will like the durability of the Slate-Core, a pressure-treated board that is injected with resin to make it hard as slate and resistant to torsion. 53" wide and 36" tall, the more than 300-pound table comes with balls, two cues, a triangle, and chalk. No matter how much somebody might want a pool table, it simply doesn’t make sense for everyone’s homes. Many people don’t have the space for billiards or the area needed to really line up a tough shot without banging your cue into the wall. Luckily, Imperial makes one of the best pool tables on the market today that is made specifically for outdoor use. This outdoor table isn’t a gimmick, it is a high-quality, fully functional pool table that can deliver a great game of eight ball and survive the elements. From the rails to the feet, every aspect of the cabinet is made of anodized aluminum to prevent rust and wear. The playing surface is a light Camel-colored taclon cloth, which is completely waterproof. Even the bed board is designed for the elements, made with 140 Formica sheets and resin for a level and hard surface. It comes with metal cues and polyester balls as well. But these weather-protection measures won’t hurt the game. The bumpers are still the reliable K66 rubber and the balls will fall into the internal pockets exactly how you want them to. This modern table is stylish and tough that many pool lovers may not know is an option. A 700-pound, 8' table is not the only way you can have a great game of billiards with some friends. You can opt for something more portable and lightweight instead, like the GSE Deluxe Folding Billiard Table. GSE offers an excellent 6' billiard table, available with green, blue or red cloth, that you can simply set up anywhere. The approximately 42" wide and 32" tall table is made with levers in the feet to deliver a level playing surface even when set up on uneven ground. Perfect for a party, tailgate, office, vacation, or game room at home, the GSE foldable table can easily be set up or stored. The table itself has a felt cloth, black rails, stainless steel corners and drop pockets for a sporty design. The 6' table is popular with kids and in situations where a full-sized, permanent table doesn’t make sense. It also features a very low price and delivers a high-quality game. For a cramped condo in the city or a home office, a conversion pool table is an excellent option. A function table for meals, work or decor most of the time, the top can be easily peeled back to display a fully functional billiard table when it's time to play a game or two. The Barns Dining Pool Table with Conversion Top from Imperial is a great conversion top for most homes. With its weather oak finish, this table looks ready for a large meal when covered but also appears just as at home when the panels are removed to show the playing surface. Made from Douglas fir with two large and stylish legs, the Barns table is available as either an 8' or 7' size. The pool table itself boasts a three-panel slate construction, while the conversion top is made of four wooden panels, which can easily be stowed. The pool table has wooden rails with accent metal sight points, rubber bumpers and internal pockets. The playing surface of teflon-coated cloth comes in a staggering 19 colors to choose from including red, green and blue. You can truly entertain however you like to with a conversion top pool table, easily switching from a dinner party to after party.